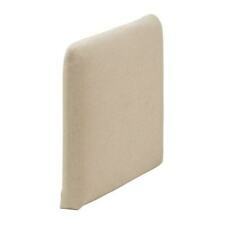 IKEA Cover for Soderhamn Armrest Slipcover Isefall NATURAL. Isefall Natural. One IKEA SODERHAMN Slipcover for IKEA Soderhamn Armrest (ONLY COVER). The cover is easy to keep clean as it is removable and can be dry cleaned. Color: Nordvalla Light Blue. Ikea EKTORP 3-Seat Sofa with Chaise Removable COVER ONLY (NOT Actual Sofa). Communication is very important, and I always try to respond ASAP. Machine wash, max 40°C, normal process. 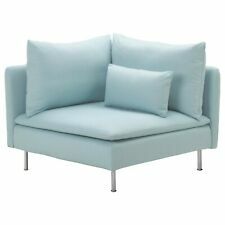 Cover for the 3 Seater with Chaise in the Nordvalla Light Blue. Ikea Ektorp. This cover is made by Ikea to fit only the Ektorp Loveseat with Chaise. The IKEA number is 503.177.61. SLIPCOVER and NOT the FURNITURE. Ikea Cover for KARLSTAD Footstool. Footstool not included. Design and Quality: IKEA of Sweden. Slipcover Bladåker blue beige. Easy to keep clean with removable, machine washable cover. A range of coordinated covers makes it easy for you to give your furniture a new look. ISEFALL LIGHT TURQUOISE. IKEA SODERHAMN Slipcover for IKEA Soderhamn Corner Section. Living Room SODERHAMN - EXTRA COVERS. Ikea Soderhamn COVER. Retired Discontinued VHTF Soderhamn Slipcover. Unopened original IKEA sealed box. You must own IKEA HOVAS CHAIR to use this slipcover. Designer: IKEA of Sweden. Color: Vansta Dark Blue. Ikea Henriksdal Long Chair Removable COVER ONLY (Chair is NOT Included). Machine wash warm, normal process. The cover is easy to keep clean as it is removable and can be machine washed. Cover in Nordvalla Light Blue. This is for the Ikea Ektorp Chair. This cover is made by Ikea to fit only the Ektorp Chair. The IKEA number is 803.177.50. SLIPCOVER and NOT the FURNITURE. This is the complete slipcover. Machine wash, warm 104 F(40°C). -The cover is easy to keep clean as it is removable and can be machine washed. Removable cover. Do not bleach. Do not tumble dry. Do not dryclean. Ikea Henriksdal Chair Fabric Cover, in Vansta dark blue. - 100% Cotton - This listing is for the fabric chair cover only, furniture is not included. This will only fit the Ikea Henriksdal Chair. Care Instructions: Machine wash warm, normal cycle. Do not bleach. Do not tumble dry. Iron high. Dry clean any solvent except trichloroethylene. ISEFALL LIGHT TURQUOISE. IKEA SODERHAMN Slipcover for IKEA Soderhamn 3 seat sofa. And that's also what creates the light, airy style that I wanted to give the sofa.". That's why we put elastic webbing in the bottom of the sofa which works together with the seat cushions to give a soft, slightly springy feel. In Finnsta Turquoise. Cover Slipcover For Footstool. Machine wash warm, normal cycle. The cover is easy to keep clean as it is removable and can be machine washed. Dry clean any solvent except trichloroethylene. VELLINGE Byvik NORLIDA Svanby FLORAL Stripe BLUE Gray..
Chaise Slipcover Cover ONLY. Armrest Cover and Sofa NOT included. NORDVALLA LIGHT BLUE NEW SEALED IN BOX. IKEA EKTORP Footstool / Ottoman Slipcover Cover. 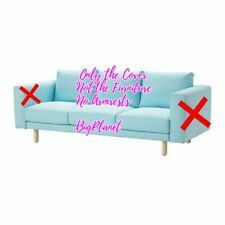 Slipcover Cover Only / Furniture Fixture Not Included. Rutna Multicolor - check. IKEA COVER SLIPCOVER for IKEA EKTORP Loveseat with Chaise Sectional. ~ B rand NEW IKEA EKTORP complete slipcover in original IKEA unopened box. Dry clean, normal cycle. Machine wash, warm 104 F(40°C). 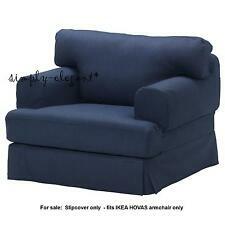 IKEA Norsborg Sofa 3 Seat Slipcover Cover / Edum Dark Blue. 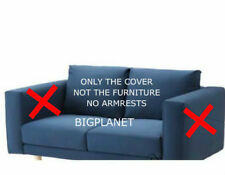 Slipcover Cover Only / Furniture Fixture Not Included. New Sealed in Box. KIVIK Cover for footstool Ottoman with storage - Orrsta Blue. Plastic covering box w/ tear, taped by us for protection. Retired / Discontinued IKEA Kivik Slipcover # 90275636. IKEA # 9 02.756.36. Design and Quality: IKEA of Sweden. IKEA Cover for IKEA KARLSTAD Chair ( for Armchair ). Designer: Tord Björklund / IKEA of Sweden. Dryclean, normal cycle. For Ikea Karlstad Footstool Ottoman. IKEA KARLSTAD SLIPCOVER. 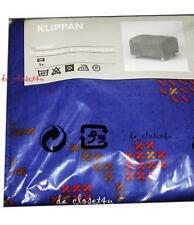 Discontinued / Retired VHTF NOS authentic IKEA Karlstad slipcover. Karlstad Footstool NOT included. Designer: Tord Bjorklund / IKEA of Sweden. In Hillared Dark Blue. For Chaise Lounge. Cover Slipcover. This product is an extra cover. Machine wash warm, normal cycle. The cover is easy to keep clean as it is removable and can be machine washed. Retired Nordvalla Light Blue. IKEA's Classic EKTORP 3-Seat Full-Size Sofa COVER/ SLlPCOVER in. This product is an extra cover. Soon to list matching chair covers- Jennylund or Tullsta. Do not tumble dry. Ikea Cover for KARLSTAD Add-On Chaise Lounge. Design and Quality: IKEA of Sweden. Slipcover Bladåker Bladaker blue beige. Chaise not included. Easy to keep clean with removable, machine washable cover. Ikea Norsborg Chaise Lounge. This cover is made by Ikea to fit only the Norsborg Chaise Lounge. Cover in the Edum Light Blue Color. The IKEA number is 003.042.14. SLIPCOVER and NOT the FURNITURE. This is the complete slipcover without the armrests. IKEA Norsborg 4 Seat Sectional with Chaise. - Chaise Section - 703.042.20. Slipcover Cover Only / Furniture Not Included . IKEA Dromminge Sofa Chair Bed Slip Cover Blue **NEW** Size 59" x 59"